Aeroline is a coach company with a difference, bringing the standards and comfort of air travel to customers to ground travel. 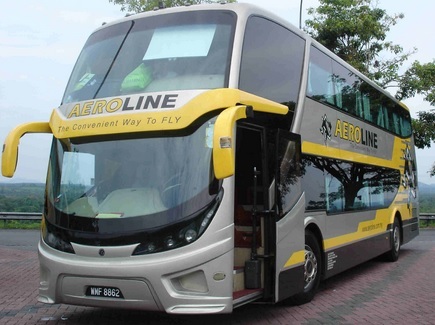 Aeroline offers sheer convenience in terms of business travel on the Singapore - Kuala Lumpur. Aeroline introduced the concept of mobile business lounges on the road, with attentive on-board crew to serve food and drinks and other creaturecomfort and at the same time, bringing travellers direct to the desired destination with the most cost and time efficient way possible. With regulated power supply on board, working on electronic devices for extended uninterrupted periods is a breeze on board Aeroline coaches.